Hello all! Well today seems to be a good day here at the Lincoln house when it comes to the computers (and everything else, lol). I got an urge earlier today to try and plug my desktop in again to the modem directly and to my amazement it worked. It is still running a bit slow but I am super excited that it isn't broke!!! So with that being said, let's get on with today share! YAY!!! Today i am sharing a nice Thank You card using some simple layering and the Hostess stamp set Simply Sketched. 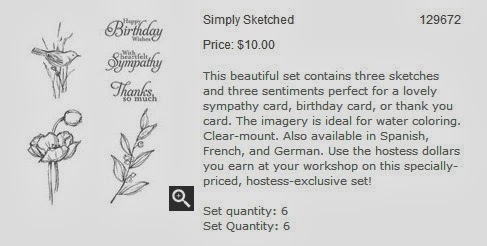 You can receive this set if you were to host a party and you reached sales of $150 or more! With a $150 party you would receive $25 in Hostess Dollars, meaning that you can get $25 worth of FREE stuff! You doesn't love that?!?!?!?!? There are many great items to choose from that are exclusive "hostess" items or you can choose from any of the amazing products in the annual catalog. So, on a personal note, today was our second showing on our home. The looking for a new home/selling current home process is quite exciting however i can never seem to get over that "weird" feeling after coming home when i know that there has been a showing. It's like... i know that someone i don't know has been wondering around our house and yet i can't really tell if anything is out of place. LOL, creeps me out a little bit:) But, i guess that just comes with the territory.